Placing of kitchen ( In some areas Kitchen is called as hearth, Oven, cuisine, cooking room, culinary, canteen, Pantry, Kitchenette, cookery, Rasoee, dine etc) is the most important factor in Vastu. Kitchen should always be at Southeast corner of the house or atleast to the Northwest corner of the house as a second-best placement. 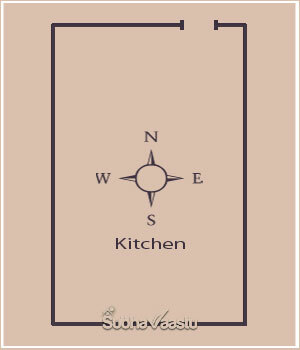 Avoid placing the kitchen at the Northeast corner of the house which may lead to unrest, quarrels, misunderstanding between the members of the house, unnecessary expenditure, (matter is from www.subhavaastu.com), worries and tensions and some other issues which we don't like to express now. It is also better to avoid kitchen at Southwest side. Otherwise, it is also likely to cause many difficulties and worries to the owner. To get the best out of Vaastu, it is always advisable to consult a vastu expert before placing the kitchen or planning for the kitchen. Whichever direction the site might face, it is best to have the kitchen in the Southeast. 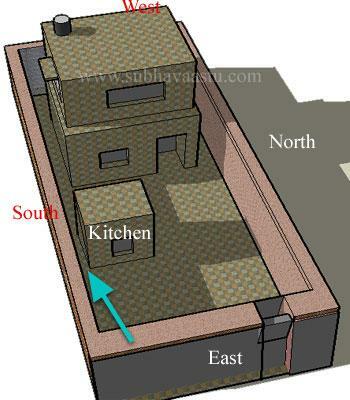 (matter is from www.subhavaastu.com) The cooking stove should be placed in the Southeast and it should be lit facing the East. By doing so, the house owner’s health and peace of mind increases. Give some importance to the kitchen in house construction, better to place an exhaust fan compulsory at the kitchen. If your kitchen is having wide range of windows or heavy air flow, then exhaust fan may not be required. Sink also better to fitted towards Northeast corner of the kitchen. Several visitors raising so many questions on this sink. Some of the vaastu consultants says that if the sink has came towards any other direction except Northeast corner. In some rich houses there are gourmet, a fine connoisseur of good food and well drink, residents pleasure with Epicure. What happens if kitchen is in North West, (Can kitchen be in north west direction): Nothing problem. Can happily place kitchen at Northwest. At no cost should the stove be lit facing the South or North (this point is not considered to USA, UK, Australia homes). One vastu consultant in New Jersey expressed his opinion, that lighting the stove facing towards North is a danger act, later again he accepted that it is not implied in to USA homes, it is also same happened with vastu consultant in New York, following vastu principles are good, but we should understand in which location/country that we are dealing, its the matter. In a South facing house, it might be difficult to have the kitchen in the Southeast hence the kitchen maybe set up in the Northwest room. In a Northwest kitchen, the stove has to be placed in the South-East, facing the West and the person lighting it should always face the East. 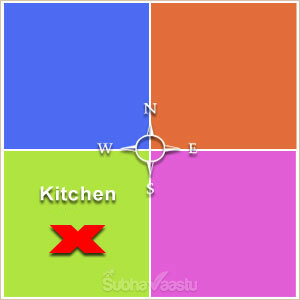 In North-West kitchen, (matter is from www.subhavaastu.com) the stove can be placed in the North-West in West, only when it is inevitable. By doing so, the stove faces the East and the person lighting the stove faces the West. As a result, the guests coming to the house increase and the women have to frequently light up the stove more often for coffee and other refreshments for the guests. At no cost should the kitchen be situated in the Northeast or in East or at North and it is very bad if already done so. 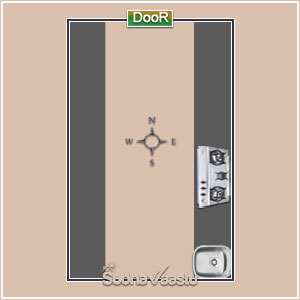 We will upload content for Vastu shastra for Kitchen northeast entrance. Be in touch with us. Pointwise we will provide the explanation here. If done so, the household money gets spent fast, there are always tensions and quarrels going on and any kind of accident may befall the people of the household. It is not that the kitchen should not be set up in the South, West or South-West rooms. If already done (matter is from www.subhavaastu.com) so try to shift it to the South-East room. If unavoidable, then the stove has to be placed in the south-East in East, facing the West and the stove should be lit facing the East. People newly constructing houses should see that the kitchen should not be set up in the South-West, West or South rooms, as they make good bedroom for the house owner and his children to sleep in. Somebody says that "in a kitchen the Eastern slab should not touch the Eastern wall", but its not easy to follow this principle, because the platform towards Southeast including the East may not touch the Eastern wall then the dust or used items, food particles may fall into that gap and it creates lots of double work and bad odor or sensation. The plat form may not be solid one, it should have space to provide to kept household kitchen utensils including Gas calendar. Attics should not be planned to store articles in the East and North particularly at Northeast. In a kitchen, the storage shelves/slabs and attics should be in the South and West including Southwest too. The kitchen should have its heavier articles placed in the South and West like the fridge, grinding machine, heavy vessels, and water storage drums. The shelves, slabs, and attics best suitable towards South and West. If anybody plans for the Storage rooms then Southwest is the best suitable, some homes this storage rooms may be an extension to the Southeast room, but its not like Lobe or flattish or projecting from the main home towards South, this extension may be inside the home only, this is also good idea to have, if it was planned like such a fissure type towards Southwest then kitchen will be the Northeast for this storeroom. Hope you understand this point. 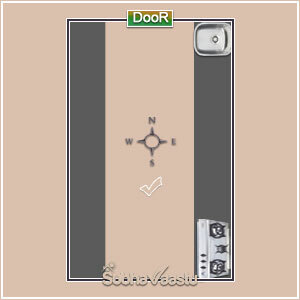 Don't change the floor levels if the storeroom is towards Southwest of this Southeast kitchen if so that would be the wrong or the entire Southwest of the home should be higher than this storeroom floor level. Further need to tell that not required to make the elevated floor level for this storeroom, if it's compulsory to do so, then one may plan for only 2 inches height floor, more than that is not recommended to have. The stove is in the Southeast-east. If the kitchen placed according to principles then food will also be delectable and delight or delicious, the life should always be special delectation sensation, residents have to enjoy such feelings in the home, dream home. Hope you may enjoy the different taste in different places of the same food, for example, if you ate some rice item in your home and the same rice item in a temple or in a hilly station then you may sense the difference, here the food is same but places were changed, likewise if vastu is good, then sensation will also be different. Here observe the entrance to kitchen, it is towards Northwest-west. Observe the stove placements. The good and bad one. Please note that if the entire house is according to Vastu Shastra principles if only this kitchen may be some sort of placement wrong, then it is not a biggest issue. If the house is not according to vaastu, then we have to think on each and everything. In the above image the entrance is at North East towards North side, this entrance is also very good, you have to provide some space towards East and thereafter fix the door, it is easy for access the kitchen and not touching the platform when we enter into kitchen. Anyhow its better to approach one expert vaastu consultant before setting the kitchen. In previous days our elders says that we have to maintain only one stove, on those days they are using only firewood burning for food making. On those days they are very cautious on every part of life, they planned to construct the kitchen / scullery / canteen / cookhouse at outside the house, in many villages still villagers require to construct the kitchen outside only. We may observe the kitchen at outside of the house still in many villages. What is it mean, those days our elders don’t have fire fighting engines, fire fighters etc. So for each and every part they are taking it as a serious thing and planning for strict proof of health and safety purposes. Nowadays we are not using the firewood for cooking the food, we are modern people with all variety of deceases and we plan everything in western country styles. We are using only gas stoves, that to the stove is compulsory (matter is from subhavaastu.com) stable stand at on open dais at kitchen. Our elders are so gentlemen and more cautious on our security. Kitchen means fire, those days they are using the firewood for cooking and the top is also made with bamboo’s , there is a right possibility of fire of the house, so they planned to through it out from the house, that is the main reason our elders are put the kitchen out of our homes. Now a days there is no such accidents. In the above image, who requires to construct the kitchen in outside then they will construct the kitchen like this way. But they have to provide some space towards the South wall. The distance between the main house and kitchen should be less than the distance between the kitchen and the East wall. Please observe the below image for more understanding of the construction type of outer kitchen. (Generally, villagers do construct like this types). Nowadays very few Villa owners also planned to construct Kitchen at outside only, but it's very less in their number. Still, villagers require to construct kitchen towards outside only. Recently we were gone through with the same in a village in Karnataka. In the above image please observe the arrow mark it shows that the gap in between the south compound wall and the kitchen. The best placement of kitchen in the house is Southeast. This is agni moola (mula). Best suitable for kitchen or fire is at Southeast. Southeast is Agni Bhagavan placement, and Northwest is Vayu Bhagavan placement, without Vayu, Agni cannot lit, so, Southeast and Northwest are the best places for Kitchen, this isthe basic principle for placing the kitchen in the house. Please note that this rule may not be applicable to all countries residents. While you are planning to make a home in India then you may keep this point in the mind to arrange the Kitchen either at Southeast or at Northwest. The second best option for kitchen is towards Northwest corner of the house or Northwest room. But here the residents are so cautious in placement of door to this kitchen, any thing wrong leads to quarrel and expenditures, mental agony etc. The measurement place a vital role here. This room dimension may be good if East and West are more than the North and South if the door has came towards Southeast for this kitchen. If the door has came towards Northeast for this Northwest kitchen and North to South high measure may not give such troubles. Have you read the above image and content. Northwest is Vayu bhagavan place, due to this Northwest also good for Agni (Kitchen). Agni and Vaayu are best suitable in Southeast and Northwest, so residents has to follow this principle. If the Agni (Kitchen or Hearth) came towards Southeast and Northwest then residents will have good health and strength and it brings positive energy to the place. If Kitchen constructed in other parts, it may damage health and strength or negative energy may be develops in that property. We are not recommending our clients for Southwest kitchen. In our observation we found that owner / resident looses money and control on the house. Moderate kitchens are not suitable towards Southwest parts. If already your kitchen is placed towards Southwest corner, then elevate the floor level. Try to always close the door of that room, keep heavy weight items in that room. More weight more good results. 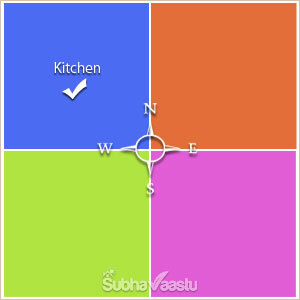 First find out the Vastu remedies for kitchen in South west, generally we never plan Kitchen to be constructed towards Southwest, the remedies may be hard but vastu expert may be find out the vastu remedies for the Southwest Kitchen. 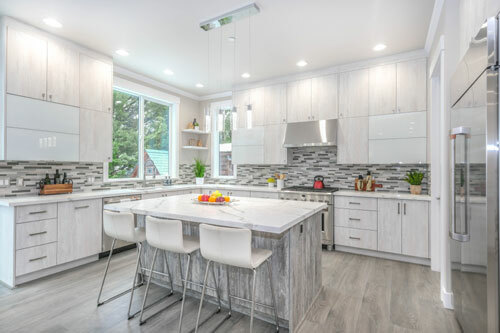 Northeast kitchen spoils the flow of positive energy into house., this place is for water and particularly water and fire does not tie up and they cannot together, they have anti chemical actions. If hearth came towards Northeast corner then heavy expenditure appears and there is a chance of more damage may be to males. Northeast Oven exhausts all the riches like vapor, renders the male residents impotent and reduces them to the stage of destitute. Hearth towards Northeast means self immolation. In some cases it may affect loss or absence of male progeny. It may also effected on children development. 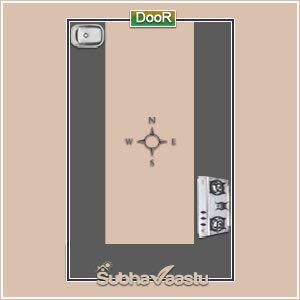 Expert Vastu Consultant can recommend the solutions after visiting the property. Regarding Burners in the kitchen, there is no count on this burners, you can plan for 3 burners or 2 burners or 4 burners stove to be placed in kitchen. Even one burner is also not a problem. Faith is different and vastu shastra is different. Don't see the odd burners of stove burners. Our thanks to Vineet Dewan, Hyderabad. Some one asks about three burners and some asks about questions and sent this image for verification purpose, please note that no problem when you are using three burners or two burners or four burners in your kitchen. In South Africa, we observed the Barbecue very near to the Kitchen. If you have capacity to bare the smell then no problem. But barbecue is not suitable towards Southwest parts of the property. Where to Wash the Utensils (dishes) in the Kitchen | Scullery Area ? Generally in villages the residents are used to clean the dishes at outside only, because they have such space and provision, whereas in cities it is not so easy to get more space for all things, that is why residents after have the food, generally keeping the dishes at sink only. For the city people there is no need to say about this answer, but for the villagers or town living people those have the provision to clean the dishes at outside, then Southwest, Southeast and Northwest the water should not be sprinkled. It is better to wash the plates in East, North and half part of the Northeast, don't wash exactly towards Northeast, keep at least some vacant space towards Northeast (read Northeast facing house vastu content here) and do ask your servants to clean the dishes as per your guidance only. Now coming to the point that, we are recommending the kitchen towards Southeast and when coming to the point of cleaning the utensils it is not so easy to carry all the dishes to Northeast, North or East directions, for them, arrange one scullery or small part of area towards Southeast and ask your servants to clean dishes there only, the used water has to move towards East or North or Northeast. Honestly speaking constructing island in cookery area is too facilitates to the ladies who are doing dishes in Kitchen. It is best facilitator for preparations of many things. If one has habituate to the island, they can't do work without island in Kitchen. It may not disturbs kitchenette. But in some measurements this may little harm as per vastu shastra. 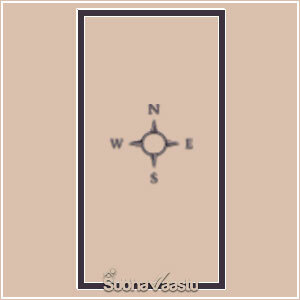 If the North and South has lesser measurements than East and West and having entrance from Northwest-west, then it may disturbs as per vastu shastra. So better to have one best expert vaasthu consultant suggestion after showing the property to him. He will suggest you the best (matter is from www.subhavaastu.com) recommendation after visiting the property. This island kitchens are very common in Western countries like USA, UK, Germany, Canada etc. In some cities homes are built with Prep Kitchens (Preparation Kitchens), these are very common with some builder homes. But Prep kitchens are not general in USA. In India many villages are even today they are maintaining separate kitchens at their house premises. Inside home there is one kitchen and outside of the home there is another kitchen, residents are more interested to prepare food at outside Kitchens only. Honestly speaking based on many factors food preparation at outside kitchen is safe and good for health too. Here is a small narration on stove placement or location at kitchen, we observed several rich people house kitchens, some kitchen (stove) are towards facing to south and some are towards facing to north also, its not a serious problem, they never informed any serious issues by putting the stove towards South and North sides, but only thing is the placement or location of kitchen in the house is the important. For example placement of Kitchen in northeast is not good, so from olden days our elders are planned to place the kitchen at southeast only, its called as "Agni" corner. Kitchen means "Fire" so fire can be sit and fit at fire (Agni) place. The northeast kitchens are giving much trouble to the residents, so its always better to place and construct the cuisine at Southeast Street Focus or next best place is northwest parts. Maximum try to place the stove towards east side, i.e., while we cook, our face is towards East side. This is the advisable suggestion. Yes, nowadays it is very common due to lack of availability of space or place. If your puja room is at your kitchen then it is advised to fix a door to it. Open puja room at kitchen is not suggested, because ladies may have 3 days monthly problem, if not possible to fix up the door to puja room, then atleast maintain a curtain to Pooja room at kitchen. Many residents are planned the stove towards Southeast part at Southeast eat-in, it is good. No doubt, what about water sink, it is good at Northeast or North or East directions, but in many houses it may not be suitable as per the adjacent structures or not possible to place in such directions because of many reasons. Water outlet may not reach to certain areas for free flow or some other reasons, many residents are not fix the sink towards Northeast corner. In such cases, some residents planned to fix the sink towards South or Southeast or Southwest parts of the platform. Please note that the sink is towards South or Southwest corner to the PLATFORM not on the ground level. Even it is a small mistake but it may not hurt heavily to the residents, unnecessarily don't get worried. I clearly checked these issues, no one has complained when they have the sink towards South or Southwest or Southeast, even it is towards West or Northwest (Sink towards West or Northwest are rare). In such cases keep water source at Northeast corner of the kitchen to balance it. Now we accustomed for apartment life, many residents don't have the independent houses. If you feels any negative results due to only this sink, or if you are inconvenient with this sink in the name of Vaastu shastra, then do one simple thing, just close the sink with one wood or plastic plank after use. Generally, we cannot remove it or shift it from one place to another place, because of water outlet pipes issue, so closing it with lid or plank is the best idea. Many residents are asking about this question many times, that is why we are planning to prepare with images. We already explained you that the placement of Kitchen in the house is important, if the Kitchen was planned towards Southeast then don't worry about the stove, sink and platform, if you are more interested to know the depth of this kitchen area portion, below explanation may be useful for you. Below is the hearth in the house. Here the kitchen platform has came towards East wall and stove was placed towards Southeast and sink was came towards almost Northeast part. There is another platform which was constructed towards West direction, door came towards almost Northeast to this kitchen. This is the perfect method. We will discuss more about all things positions below. Please go through below. Here, sink only changed. Observe the above image for the changes. This sink is exactly fixed towards Northeast. Observe the "right" mark at the center of the image. Yes, this is also right, but if possible its always better to leave little space towards Northeast. Leaving at least two feet is good. But now we don't have such spacious properties, most of the properties available for us may be congested. At this moment we cannot leave more space in certain areas, so maximum try to leave some space at Northeast corner if it's not possible then plan the sink as shown here. Based on this rule, some residents are leaving 2 to 3 inches gap in Northeast corner after the sink, this is wrong, WHY? , if we left only 2 inches, then there is no possibility to clean that space regularly because of lesser accessibility, our hands never go there to clean up the area. If dust forms then generally bacteria will develop, automatically health disorders occur, be careful with such ideas. Based on the space availability, you may plan the sink shown in this image. In some houses sink places towards Southeast corner. Due to some limitations or piping system, sink may be placed towards this place. Is this right or wrong? Please note that we already discussed on this issue that, sink is just like dig / hole / sump / depression / pit / pond / cavity / cylindrical depression/sunk into the earth. But here it is not like that, what ever the sink was placed here was not proper placed on earth/floor, you are well aware that this sink was placed only on a platform, its not done on earth. So don't consider it as a hole on ground or floor or earth. If your kitchen was already done like this, don't worry at all, if there is no platform and sink and you are planning to fix this system then better to follow the above. We have taken reviews from many people who are having this type of Southeast sink, there is no new issues were generated. After changing this sink they may not get huge results. A little / very small changes appears, that may not be count. Peace in the family is important. If you found this Southeast sink at your property, unnecessarily don't get afraid. Just leave this issue and appear your regular works. There are major and minor issues in the house as per vastu, this is not the major, hope you are relaxed now. Sink came towards South part of the kitchen, what happens, same as above . . . please read the above paras. Is there any plan to place the kitchen, then don't plan the sink towards Southeast, South, Southwest, West, Northwest etc. Particularly Northwest direction sink may not be good if the stove is exactly placed towards Southeast. Now its position is towards Southwest, this is wrong method, coming to this decision, please read the above paras carefully. To know more on this issue, please read the above paras, then you may understand this issue. . . . . some writers have written that this may cruelly damage ladies health in the house, don't get afraid of such words. No cruelty damages found when the sink was placed towards West part, if the kitchen was exactly placed towards Southeast at residence. If the measurement of this room is North to South is double than the East to West then this placing of sink at middle of West is wrong. There are some in depth secrets are there in Vastu Shastra, placing of Sink towards Northwest is wrong, if the measurements of this room from North to South is double than the East and West measurements. Don't plan if the measurements are like such a way. In many books the sink towards North is good at kitchen, it may be but we are not giving the plans like this, why ? if the measurements of this room was more from East to West than the North to South then this placement may not give such a good results. If the North and South is more than the East and West then this placement is good. Check the measurements in this room, if not please observe the above room measurements and this room measurement. This measurement is not good if the cuisine is planned at Southeast. If cookery section was planned like this way towards Southeast, then Northeast-north door is highly recommended and excellent. Northwest-west door may not be the right one. Little bit problems may arise here. If the kitchen was constructed like such a way and it has only Northwest-west entrance or West entrance or Southwest-west entrance for this kitchen, then compulsory plan to fix one door. Arch and open entrance may be wrong. 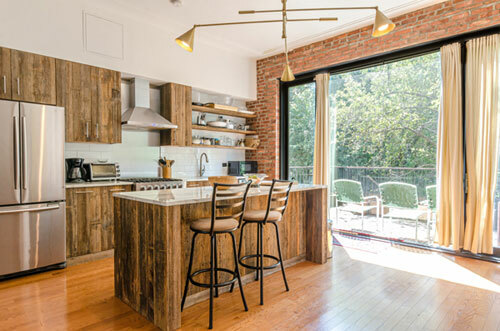 In such cases, if the Northeast was cut in the name of car parking or any other reasons, then this type of kitchen room construction may damage the peace in the home. This measurement is rightly suited at Northwest, further if this kind of measured room was placed at Northwest and if it has East (Not Northeast ) door then this becomes the successful kitchen. Observe the difference in measurement of this room. Now this is North to South more measured than the East to West, this is excellent when it was planned towards Southeast. Wherever the door for this measured room at Southeast it wont affect to the inhabitants. On the same way this may not be good to fit at Northwest kitchen. 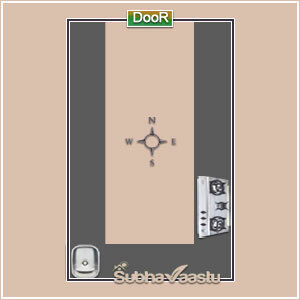 Please note that if the door is towards Northeast-east then this measurement suits at Northwest. There are many secrets in this science, if you contact one expert vastu consultant, he will guide you many more secrets. Reading the vastu books and constructing house may be the wrong thought. Think twice before taking the decision. Unfortunate thing is that most of the residents preparing their house plan by knowing some information through websites and vastu books, finally they lose money, pease, their hardship, the astonishing thing is that they never care for future losses but they are very keen to save vastu consultants fee at the time of starting of the construction or buying the plot. Fate is great and God's decision is the final ,that is why they are behaving like such a way. They knows very well that vastu consultant fee is very smaller when compared with their properties but they need to save that money and facing severe issues in their future, this is the play of FATE. In South facing houses or in some houses, some residents may plan their kitchen towards Northwest area, instead of Southeast. If so stove may not fit towards Southeast, instead of Southeast they may plan at Northwest. The kitchen or hearth platform may be constructing towards the West wall not touching the Northern wall. So the dish may be prepared by facing towards West. At this moment the sink may plan towards Northwest and not touching the North wall, the best position for sink is towards East or North. But it may not possible to fix at these directions. The next best place is Northwest corner without touching the North wall. 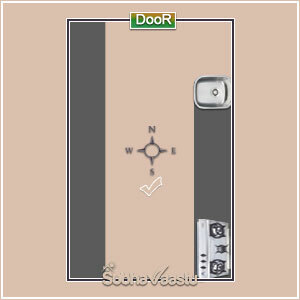 The best and suitable place for stove or hearth position at Northwest room is Southeast corner, cook food faces towards East and stove is faces west, this is the ideal placement, if it is not possible then construct the stove platform to West wall. Some times some inhabitants may raise the Southeast-east part in the name of Kitchen, they thought that extending the Southeast is good. But this extension leads to Southeast-east extension and such an arrangement increases Eastern Southeast, which is bad. In a Kitchen the stove should be kept on a seat or platform, but not on the floor, it is our duty to invite Agni Maharaj the fire God, with due respect to our House. It is preferable for the one who cooks, to light the stove after taking bath with a Namaskar to Agni Dev. The first part of the food should be offered to Agni Dev and get his blessings. 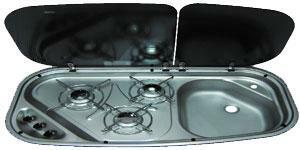 Some residents (particularly students, bachelor, employees, singles, paying guest houses, single women at rented properties etc) are using only Electrical stoves like Induction cooktop or induction bottom cookware etc, where we have to keep it at Kitchen, if there is no Gas stove at kitchen then please place this cooktop at Southeast corner only. 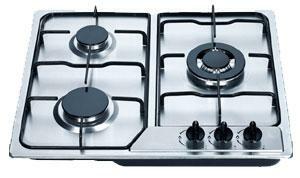 If there is gas stove then place this cooktop at East, adjacent near to gas stove. Always keeping fire element only towards Southeast. Somebody has doubt that using Gas cooker Electric cooker, both has same impact, because Gas cooker gives real fire flame. Electric cooker gives heat only. Well, the answer is always same as we discussed above. 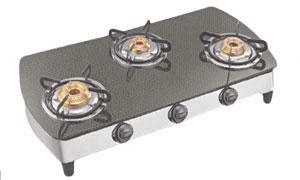 These gas stove and Electric cooker or Electric stove are to make food only. Best to keep them at Southeast only. Otherwise East. If there is no space towards East then find it a place to keep in some other directions in the Kitchen. Maximum try, not to keep electrical cooker at Northeast place. Kitchen placement towards Southeast is always preferred, the small mistakes in this Southeast kitchen may not lead the suffering of the inhabitants. 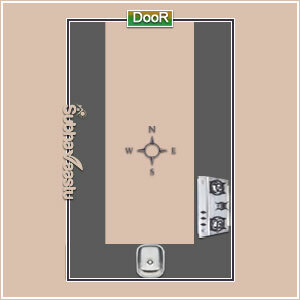 Due to space constraint, we cannot find the spacious locations always in view of maintaining exact vastu principles. If Kitchen is not towards Southeast or Northwest then only we have to take care on all tiny things where to keep, how to keep etc. Other than that nothing problem happens. Just cook food and eat and enjoy, that's all forever. My kitchen is of size 10ft by 7ft . from east to west it is 10 feet and from South to North it is 7 feet in that platform of granite is of 2ft .It is of L shaped . The Problem i am facing is the gap between the sink and gas stove is just 1ft .So if i place the gas stove in south east direction i get more space.But if i keep the stove in east direction i get only 1ft gap for sink and stove ?. Answer: Placing the stove towards the Southeast is good. Hope this suits your question, in addition here is our some more clarification. Due to place problem, most of the residents are now placing the stove very near to the sink. If the sink may come towards Northeast then its good, but in many houses the sink was placed towards South direction, this is not a biggest issue. Because the sink was planned in the platform only, it was not placed in the ground, the logic is there is no any depression towards South floor, the depression is only on platform, so nothing problem arises when the sink was placed towards South or West side, but always plan the sink placed towards Northeast direction. 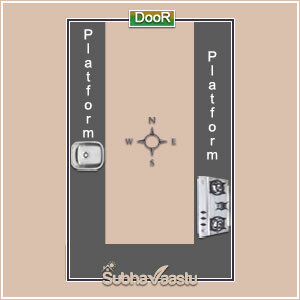 If your platform is L shape then there might be a problem may occur in the name of standing when the stove is placed towards Southeast, there may not be any facilitation to cook, because the L shape may disturb you, if there is a space if the stove is towards Southeast then no issues at all. In addition here is a tip of measurement for the kitchen. If the kitchen is towards Southeast then North to South measurement than that of East to West is better. If the Kitchen is towards Northwest then East to West measurement than the North to South is better. My Friend Sathyam Planned A Toilet Above The Kitchen, Is This Any Problem As Per Vastu? If we ask this question to elders they will be Gurrrrr on us, because elders never accept this method of construction, to be honest elders never accepts toilets to be placed at homes, but days were changed and many things were also changed in our society. Why elders never accept toilets above the kitchen. In olden days there is such facilitation of guard the water leakage, when we visit many homes we found water leakage may be common in the homes. Toilet means the dust water, WOK, etc may flow, if there is a leakage we can't stay in that property. In some places, residents adjusted with any structures or any construction alterations and doing their jobs. Finding very good property with exact conditional homes may not be so easy to avail. We have to adjust in certain cases, this is the life nowadays for most of the residents. If there is no leakage means there is no harm, if you have any other options then you may try to find another property. Here logic is working. In the future, if there is effluence observed, then what shall we do?, so keep it in your mind and then only take the decision. You are aware that the standards of builders and constructions. Still you have doubts let us know. Is Kitchen towards Northeast is good or bad: We are saying that Northeast Kitchen is not good, this below email will also says the same. Hi, I have serious vastu defects in my current property and lots of suffering (financial, illness and divorce in family). It is difficult to find Vastu complementary homes in the UK. We need to move soon. I have an east facing property that has potential but I'm concerned about the northeast kitchen and toilet in southeast. We will be moving as my parents are divorcing. So the current property will be sold and profits split between them. Bathroom and kitchen in northeast, the boiler is also in the Northeast corner! there was no way they could stay together. My father's drinking and gambling is totally out of control. I know the kitchen in northeast is not good however the bedrooms that will be used are southwest. Can you please advise if remedies would be okay here? I'm keen for my mum and I to have an auspicious new start. But there are few properties available where we are, and fewer that we can afford. Sorry for the long email. Thank you for your kind help - Kumari - Loughborough - UK. Some residents are requesting us where to plan for the windows and ventilators: If your kitchen is towards Southeast then the first preferred window is towards East direction, better to not plan for the exact Southeast-east and Southeast windows. Suitably suits windows towards Southeast-south. If the kitchen is at Northwest then window may be suitably fit towards North wall. Better to plan this window towards Northeast-north at that North wall. West window is not a problem to have. No need to worry on Western windows. Ventilators are good to have both at West and North too. But make sure to keep one mosquito net to be fitted to that ventilators, so that mosquitoes and lizards are not enter the home. While coming with Southeast kitchen ventilators are best suitable towards East and South walls, here also mosquito net is important to have. Some residents asking about this question, Constructing the bathroom on top of the Kitchen, is it acceptable check out answer in that link. 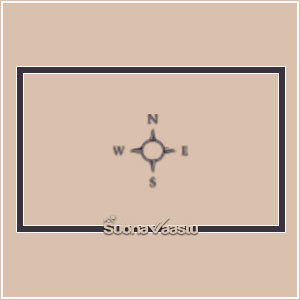 Southwest facing house vastu is good? Is Northwest facing house is good to buy? 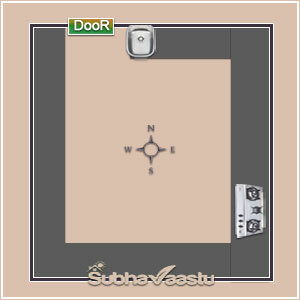 Which direction property is good as per my name in Vastu Shastra? If toll-stones appears in house, what are their bad effects? How to contact Good vastu consultant in Bangalore city, planning to buy home? I took one apartment for rent, Its kitchen is in North side almost center. And after the kitchen, North East corner there is one more room. And its master bedroom is in North West Corner. Sir, Here I want to know, my kitchen is in wrong place or not..? If that is in wrong place, is their any remedy for that.. Please help me..I am from GCC. The kitchen room is located in the midwest of the appartement and the sink is on the left next to the gas stove which is in north direction so i cook facing north. The solutions i would have is to put an other gas stove against east wall of the kitchen room or out of the kitchen. The appartement is not mine i just rent it. I don't know what to do ! could you please help me? Namastey,I'm living in London. My house is independent. The main door entrance is east then little passage after kitchen entrance door comes. So I can't put my gas cooker in the southeast I don't have choice I have to put my gas cooker in North side is any remedies for that. My kitchen is in northwest but I can't put stove in the southeast where is the kitchen entrance I have only one option to put gas stove north side what can I do? My home main entrance is east. Can you help me pls. I am constructing a new home where the kitchen in the North West Corner. The kitchen slab is a U shaped slab spanning in East (4 ft), North (8 Ft) and West (4 Ft) Direction. I am planning to keep the stove on the East slab, Sink on the North Slab towards the north west corner but not touching the west wall, Microwave in either North or West Slab and Aquaguard in the either West or North direction towards the North west corner. The Windows and Exhaust fan is in the North towards the North East Corner. Storage chajjah is in the West and South ends. Please advise if the above vastu is correct or if any corrections are required. My stove is not directly facing kitchen entrance but it is just slightly left on slab directly opposite to the kitchen entrance so its completely visible from entrance. What should i do? Also my kitchen is in east and entrance from west. Again what should i do? Please advise. 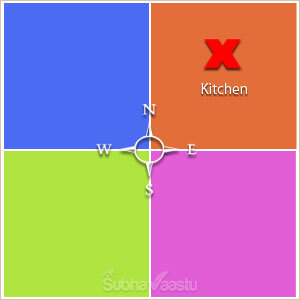 I have kitchen of size 9' from North to west and 7' from east to west direction. It has U shaped platform at east north & south walls. Please suggest is OK? and where to keep refrigerator, water filter, microwave & crockery unit? Please, help me, my kitchen is north corner of diagonal plot, i m facing SW while cooking, my sink it s on the corner of W and the stove on the SW,the paint it s allready pink, please give me some remedies, i m not landlord, i can t brake anything, thanks a lot. My kitchen is placed in south east of the house.Gas stove is placed in the center of the kitchen.I cook food facing north. It's an open kitchen and my face remains towards north (open side of the kitchen. Is it OK position as per vadtu? I have a balcony outside the kitchen. My kitchen is on South East. Is it true that wash area should not be back to back to the gas stove. Please advise. Dear Sir, I have a 3 BHK rented flat, out of which 2 rooms have attached bathrooms and one bathroom is common. The western commode situated in attached bath rooms are towards east (means if a person will use it he will show his back to east and face at west) and the western commode situated in common bath room are towards wast (means if a person will use it he will show his back to west and face to east) Somehow I know this is not good, request you to suggest remedy for this as it's not my home i cannot make big changes by removing the commodes (Reconstruction s of toilets) Expecting some response from your side. I want construction my sweet home. My Plot is west faces and in Construction map my kitchen direction is west &south corner. But open space in front side of plot is 10 fit. So please Help to setup stove & sink in my kitchen. My Kitchen is open & joint with lobby in east side. Please help me for setup of my kitchen. Our house is constructed by housing board and while cooking face remains towards North or North west. Sink is towards south /south east.Whether this situation is correct and if not what are the remedies. my kitchen palfform is east facing and sink is at south-east side, it is not possible for me to change the direction of sink. can you please suggest some remedy to this issue my very much worried. please suggest some solution. My apartment fairly vastu compliant. Kitchen is constructed towards the north west. 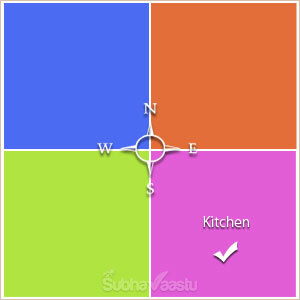 As a result while cooking I face south or south west. I have read earlier that if you hv a North west kitchen, then it is ideal for the cook to face west while cooking. Kindly advise. If it is right I will get my cooking range shifted in a,manner so to face west only. Mine is an open kitchen with open door facing east. Our is open kitchen,7feet*8 (length)it is not having west wall ,it directly opens into dinning .can we place our since in sw corner of kitchen?